Sun Valley Nats Day2 Task 1 - Cancelled due to wind and low cloudbase. Once again the day dawned cold and cloudy in Sun Valley. The forecast wasn't very encouraging but we headed up to launch with an optimistic attitude, ready to fly above this amazing scenery. Upon reaching the summit, we found ourselves in the base of the clouds at 32°F. Soon the sun was peeking through, and cloudbase lifted a bit, so the task committee build a task similar to yesterday's aborted task with an upwind return to DURLZ for a total distance of 50 Kilometers. Initially a 2:15 start time was set and we all headed for the launch area. The winds were quite cross at launch and, when the wind-techs got into the air, proved to be quite strong from the South in the valley. The winds continued to freshen and were about 60° to 90° crossed so the meet director put the launch on hold. After putting launch on hold for a while, and consulting with the safety committee, Meet Director Dave Glover cancelled the task. It's disappointing, for everyone, to start a comp with two cancelled days. Mike Pfau has been very generous with pizza and beer for the idle troops while spending our "down-time" in Sun Valley and Ketchum. Tomorrow looks unlikely as a taskable day but we will be in position if conditions allow us to fly and compete. Thursday through Sunday are looking much better and we hope to see the area from the air soon. Sun Valley Nats Day1 Task 1 - Cancelled due to wx. The morning was very cold today and forecasts indicated it would be in the 20'sF at cloudbase, so we all wore our best insulation. We met at the top of the hill at 10AM and a pilot meeting took place in the restaurant shortly thereafter. Overdevelopment was predicted and a short task was called to Galena Lodge, 31K North of launch. The cloudbase at this point was fairly low and we all headed for the launch area to prepare for the task and get our gear in order. Conditions were not conducive to launch so the window was postponed in short increments for 90 minutes before the meet director cancelled the task. We were seeing some overdevelopment and precipitation and there was concern that we would be threading the needle to call the launch and start, while allowing sufficient time to fly the task in rapidly developing conditions. After the task had been cancelled, a few set-up and launched into fickle conditions that included light ice-pellets and back-wind launches. For an interesting view of the day's progression, you can view a time-lapse of Bald Mt. weather as we set-up and eventually head down the hill HERE. Select the Lookout detailed video for the best look at the sky's progression. Tomorrow is still looking taskable so we will be at the top at 10am again. The troops are gathering for the second leg of the US National PG competition. The terrain is spectacular and the tasking options are many and long. Yesterday was overcast and dismal looking but I had an hour flight, mostly ridge soaring the bowl on Baldy. Today (Sunday) is the official practice day, but most of us slept in. The weather was forecast to be overcast today and a bit wet, so a flew pilots launched and flew locally. The launch conditions were cross and strong when I jumped off the ski lift at launch and, after watching a few pilots launch and a few ride down on the gondola, I opted for the gondola also. I spent the day doing some last minute tweaking to my equipment and adding my survival kit to the harness. The deep terrain and sparse roads should be a bit intimidating to those with sense. The potential for a long walk-out, or even an overnight in the bush, is real for those who place themselves deep and committed in the terrain. The towns of Ketchum and Sun Valley have welcomed our presence with enthusiasm and some discounts, so non-flying days will be enjoyable. Mountain biking, kayaking, tubing, and hiking are all just a short distance away. Tonight the pilot meeting was run by Mike Pfau, who briefed everyone on local rules and procedures to be followed. We will be meeting Monday morning on top of Baldy for the pilot briefing at 10 am and (hopefully) we will get favorable weather for a task. The forecast is still fairly "iffy" for tomorrow, but conditions are looking favorable for later in the week. If we do fly on Monday it will be very cold so the long underwear and hand-warmers will be put to use. It was great to see the usual crowd tonight and there are more than a few foreign pilots joining us this week. The meet organization is looking sharp and this week looks like it should be great. For an interesting twist to the B1Nav saga, see THIS. The B1 NAV comes boxed with a very nice storage case to protect the unit when knocking around in your kit-bag. The case is a hard case with zipper and protects the screen from damage. A USB cable is supplied for unit charging and data transfer, as well as wall charger for fast charging the unit. The B1 has a nice 'feel' with a plastic case that is sturdier and more streamlined than the Flytec 5020. The screen size is twice the size of the 5020 with a resolution of 320X240, and similar in size to a 6030 - a nice big display. The four UI buttons are easy to use with gloves and their use is intuitive. In general the package is well designed and robust. Noticeably missing from the packaging is a User Manual. For that, one needs to go online. This is a reasonable solution since documenting firmware upgrades can be done more efficiently with an online revision to the manual. More about that later. Out of the box the unit had firmware ver. 1.16 so I went online and found that the latest version was 1.20. Downloading the Flash program and installing the revised firmware was simple and easy. I used GPSDump to load the Chelan waypoint file and, 15 minutes after plugging in the USB cable, was ready to aviate. Setting up the User Defined Fields (UDFs) was simple also. The list of options available for UDFs is extensive and expanding regularly to meet the requests of pilots. There are two groups of six UDFs programmable by the pilot, so having 12 UDFs available provides a large amount of visible information. The Guts - The B1 Nav uses a 50 channel GPS engine and seems much more reliable than the Flytec GPS system. The battery is a built-in Lithium-ion battery, charged by a USB cable. A wall charger is included and will fast-charge the battery. A connection to any USB port will slow-charge the unit. Battery life is reported to last over 20 hours. I prefer to have the ability to swap out batteries (like my 5020) but the versatility of the charging options and battery life makes my bias moot. This unit has the standard variometer features, which include a definable cadence and frequency. I chose UDFs that suited the type of flying I was doing - XC competition Race-to-Goal. Every popular UDF option is available and more are being added with each firmware update. The screen shown at right is the small vario version of the display, with six UDFs visible. 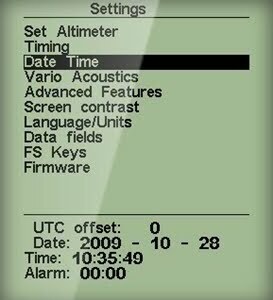 The display shown in the top graphic is the large vario version with four UDFs. To switch from one group of UDFs to the other involves the push of one button. It's obvious that a lot of thought has gone into the programming of this unit. It has very useful features that other integrated GPS units have failed to provide, while gleaning the best features of the existing units. As an example, when programming the 5th task of the PWC in Chelan, the Flytec and Garmin units were unable to program the task as assigned. We all 'worked around' the task parameters to make the task defineable on our various units. The Flymaster, on the other hand, was able to allow definition of the entry/exit cylinders as assigned - While the top pilots in the world, with the fanciest GPS units made were having fits to define the task. Chris has been flying in competitions for many years and has developed a suite of very interesting features. For example: The Buzzer - The Buzzer is an audible indication that you are not climbing yet, but that you have entered an area of buoyant air that needs exploration. One thing that I experienced (and it seems universal) was an initial feeling that the unit is way too noisy. Soon though, after adjusting some of the audio parameters, and a desensitization period, I grew to appreciate the information provided by the various growls and noises emitted from the unit. The Buzzer is a nice addition when scratching in weak conditions and I found it very helpful. The Thermal Core Indicator - Initially I doubted the value of this feature. 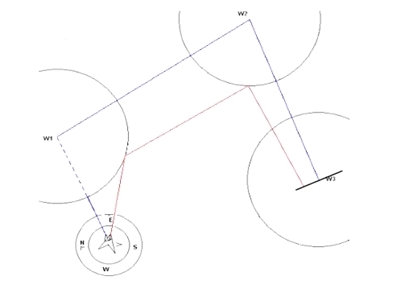 The B1 Nav looks at the rate-of-climb in 50 meter altitude slices and plots the location of the best lift. This feature is very helpful in re-centering and staying with lift when climbing in winds and/or inversions. I actually grew very fond of this feature. A word of caution though. Less experienced pilots may become a bit too fixed on this 'dot' and not realize that it only plots the best lift that you have flown through. It is still necessary to explore the area so as not to miss the real core of the thermal. "Long floaty glides in the smoke til about 10k from the turnpoint (set to keep us from going over the back of the hills), then long sinky glides to the turnpoint. The flymaster pilots are good to know when trying to find the tangent point on a 5k cylinder, I imagine all the other instrument makers will be upgrading software to optimise routes round big cylinders now." I do not think the optimization includes wind factors in its calculation, so there is still some room for the pilot to increase the optimization, but this feature is a big help. 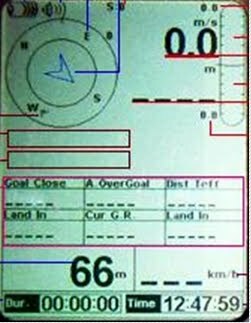 Versatile Start and Finish Line Programming - The B1 Nav allows for the programming of tasks in all types of competitions. In the aforementioned example at a recent PWC event, we had to do a normal 'exit' start around a fix, then fly to a 50Km radius exit cylinder and back. The B1 Nav allowed the programming of both cylinders without problem. The programming of a 'Finish Line,' often used at PWC events, is also possible. 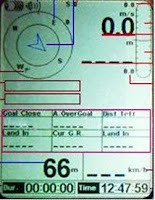 A finish line is perpendicular to the last courseline and a set width (see graphic above). 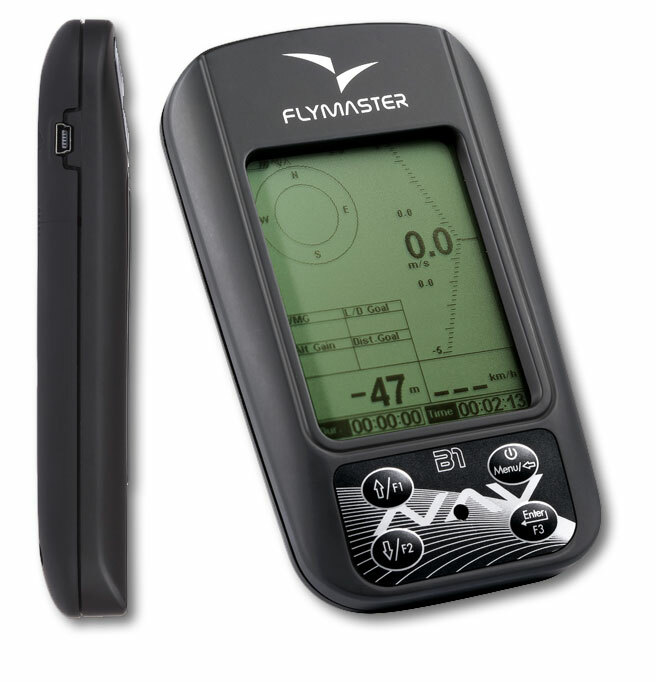 Overall Impressions - The Flymaster B1 Nav is a versatile, powerful, and robust instrument. The firmware is being revised often to meet the expectations and requests of the users. The presentation provides plenty of information and has a user interface that is intuitive and easily navigated. Most importantly, the guy who has driven this project and builds the B1 Nav's back-end brains, is involved. Christiano participates in dialogs with the pilots who are using his product and revising it to meet our needs. This is one of the most exciting aspects of being a B1 Nav user. When a problem is encountered or an idea for a new feature is voiced, we have the ability to participate in the process. This is how a software driven instrument should evolve. I asked a local US dealer about service for hardware problems, and he indicated that most hardware service will be handled locally, allowing a quick turn-around. The pricing of this instrument has allowed many more pilots to consider an instrument of this caliber. With a retail price below $700US, the B1 Nav is half the price of comparable units. Don't underestimate this tool, it is made with quality, versatility, and pride. I got my unit through WWW.FlymasterUSA.com and Jug also takes good care of his customers, providing quick service turnarounds in the US. Well, as I've written here before, I need to get into the air as much as I need to breath the stuff. It's not a rational thing. I'm comfortable that I am acquiescing to the irrational. An artist does the same when he allows his strokes to be spontaneous. A potter does the same when he whacks an otherwise symmetrical pot to make it unique. I fly paragliders because they give me wings; and who among us haven't had dreams of flying unencumbered by the limitations of wakefulness. I just came across a great video that expresses the obsession of paragliding well. I share in this pilot's addiction, to his fears that one day, I too will be unable to feel the freedom and exhilaration of foot-launched free flight. "I fly, because I can."